Part 5 of a 7 part series on Smart Beta. My research papers, “A Survey of Alternative Equity Index Strategies”1 and “The Surprising Alpha from Malkiel’s Monkey and Upside-Down Strategies,”2 find that most of the commercially available Smart Beta indices contain meaningful exposure to the value premium. In fact, I show that almost all non-price weighted index schemes will naturally access the value anomaly, which can be interpreted as the effect of contrarian rebalancing against long-horizon mean-reversion in equity prices. Long horizon mean-reversion in stock prices exists in the entire cross-section of stocks. Thus contrarian rebalancing—buying what has fallen and selling what has risen in price—can be applied to all stocks in the equity universe to extract the value premium. This approach is vastly different from traditional style investing based purely on buying low price-to-book (P/B) stocks. In this blog post, I look specifically at traditional value style index construction, and I contrast it with the Smart Beta approach to extracting the value premium through rebalancing across a diversified core portfolio, as represented by the Fundamental Index® methodology. Value investing has been known since the early 1920s to deliver superior performance. In the 1990s, with the growing popularity of the consultants’ nine-box style matrices, index providers sought to provide investors with transparent, low cost “beta” exposure to value investing through cap-weighted value indices. By and large these first generation value indices were constructed by selecting stocks with low P/B ratios and then cap-weighting them. Over time, the methodologies evolved to include other measures of value, as opposed to growth, and to situate stocks on a value-growth continuum. The value style indices have produced outperformance against the broad cap-weighted market index. However, their structure raises some questions. It is well understood today that, as “value” signals, ratios such as P/B and price-to-earnings (P/E) are more meaningful for comparing stocks within a more homogeneous industry. Using P/B and P/E to contrast stocks across different industries is substantially less useful. Therefore, the aggressive industry active weights, resulting from favoring stocks from industries with traditionally lower valuation ratios, are sub-optimal approaches for exploiting the value effect. Second, although traditional value style indices are reconstituted once a year, they cap-weight the stocks that are selected into their value baskets. Consequently, the weights of the stocks in a value index fluctuate with prices. For example, prior to the Global Financial Crisis, many of the large banks became expensive relative to their own historical valuation ratios. The cap weighting scheme meant that these expensive banks also took on very dominant weights within the value index just prior to the banking sector crisis. Similarly, just at the nadir of the crisis, when banks were trading at historically low valuation multiples, they also took on substantially reduced weights in the value index before the financial stock recovery of 2009. 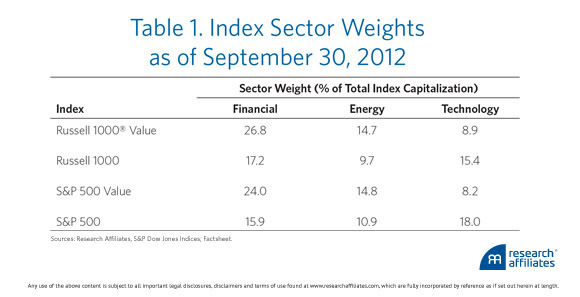 Table 2 displays the weights of major bank stocks before and after the financial crisis. Today, many academics and industry practitioners interpret the value investment strategy as capturing mean-reversion in stock valuation ratios. Under this interpretation, rebalancing against price is critical for exploiting the long-horizon mean-reversion. Applying cap-weighting to “value” stocks eliminates, substantially, the opportunity to exploit mean-reversion. By contrast, some of the better constructed Smart Beta value indices offer more modern approaches to capturing the value premium. Let me use the Fundamental Index® strategy as an illustration. Because the Fundamental Index approach weights stocks by size fundamentals such as book value and total cash flows, and since these size-related fundamentals track capitalization over time, the Fundamental Index strategy generally contains industry exposures that are reasonably similar to the broad market index. For example, as of September 30, 2013, the FTSE RAFI® US 1000 Index held 21.0% in the financial sector and 11.7% in energy stocks (compared to 26.8% and 14.7% in the Russell 1000 Value index). Thus, much of the active shares of fundamentals-weighted indices are taken up by intra-industry bets—for instance, overweighting Ford and underweighting Tesla. Industry based active shares only become large if an industry becomes significantly more expensive relative to its own historical valuation level. The Fundamental Index also rebalances annually against valuation ratio movements, buying what has become cheaper over the course of the year and selling what has become more expensive. The rebalancing is effected over hundreds of stocks across all industries. This, in effect, amplifies the weak time-series price mean-reversion effect through the law of large numbers in the equity cross-section. 1. Tzee-Man Chow, Jason Hsu, Vitali Kalesnik and Bryce Little, “A Survey of Alternative Equity Index Strategies,” Financial Analysts Journal, vol. 67 no. 5 (September-October 2011), 37-57. 2. Robert D. Arnott, Jason Hsu, Vitali Kalesnik, and Phil Tindall, “The Surprising Alpha from Malkiel’s Monkey and Upside-Down Strategies,” Journal of Portfolio Management, vol. 39 no. 4 (Summer 2013), 91-105. 3. Rob Arnott, Jason Hsu, and Philip Moore, “Fundamental Indexation,” Financial Analysts Journal, 61/2 (March-April 2005), 83-99. 4. Towers Watson is credited with coining the phrase Smart Beta to describe non-price weighted indices and Bulk Beta for describing traditional cap-weighted indices. Towers Watson used the word “Smart” to suggest that investors need to be smart to make the right Smart Beta selection.